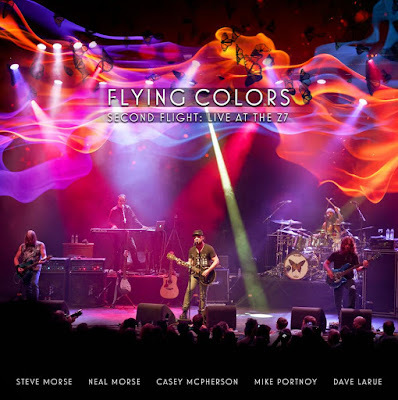 Let’s be honest right up front - Second Flight: Live at the Z7­, the latest two-disc live album and live DVD offering from Flying Colors – is nothing short of great. First and foremost, if nothing else, Second Flight: Live at the Z7­ shows that Flying Colors may be very well be the tightest, most cohesive group in the rock game right now. There’s a number of instances here that back that statement up – from seamless time signature changes (“One Love Forever”) to flat out memorable moments (“Kayla,” “A Place In Your World,” “Colder Months,” “Mask Machine”), Second Flight: Live at the Z7­ is the culmination of pinpoint perfect musicianship. And while not much else needs to be said about the players involved, it would be naive to not at least address it in some small fashion – whether it be drummer Mike Portnoy during “Shoulda Woulda Coulda,” bassist Dave LaRue on “Forever In a Daze,” or frontman Casey McPherson during “Peaceful Harbor,” there are plenty of special moments to be had throughout Second Flight: Live at the Z7­. It’s a suggestion to listen to the two-disc set before you watch the DVD – you’ll get more enjoyment out of it that way. Attention rock fans - Second Flight: Live at the Z7­ is a must-own – this is what live albums should be.